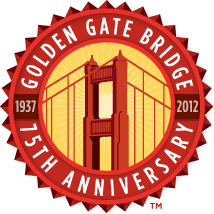 It's the 75th year of the Golden Gate Bridge and it's time to celebrate! Join in our 75 Community Tributes program with a variety of activities throughout the San Francisco Bay Area and beyond. For information about a specific Tribute event, please contact the host organization directly. And save the date for May 27 for the big celebration, The Golden Gate Festival! Thank you to our lead underwriters Genentech, Hewlett-Packard (HP), Kaiser Permanente, and Wells Fargo, our supporting corporate partner, Odwalla and additional supporters Hanson Bridgett LLP and Levi Strauss & Co. Solar Beacon is an art installation on top of the Golden Gate Towers that reflects the Sun’s light throughout the Bay Area.